I recently mentioned that my friend, Deborah, and I have been working on the Couch to 5K running app. We recently finished up week 3 and while we are so far from running a 5k, Jillian in our office conviced us to sign up for a 1 mile run this past weekend. She enticed us by telling us this run just so happened to be called “Breakfast on the Track” meaning after you run they give you pancakes… Sold. 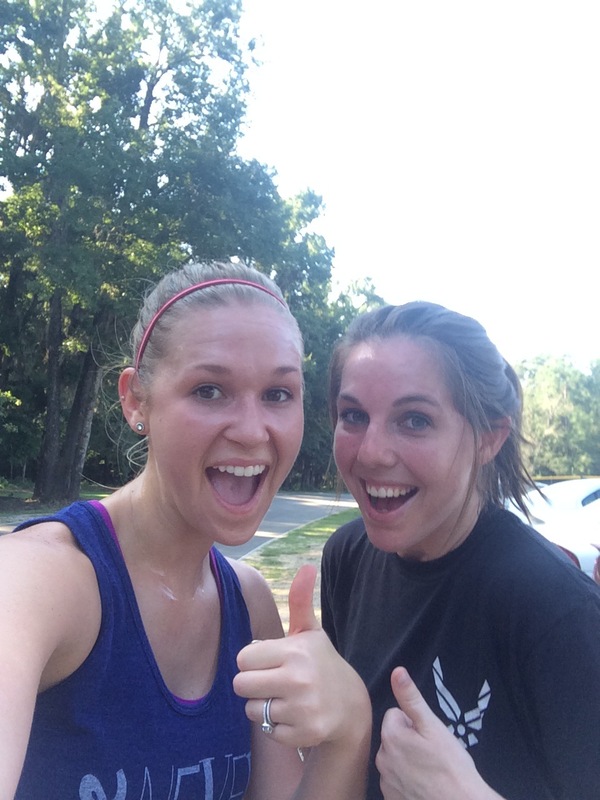 So Deborah and I signed up for this run and we were pumped… until we got there. We get there during the first heat. AKA people running the mile in less than 5:30. Meanwhile – we are over here just hoping to run the mile without having to stop and walk. Can we talk about how intimidating this is?! The whole time people are running we are talking ourselves out of this. If we leave now Jillian will just think we never showed up. If we leave now nobody will see us finish last. If we leave now we can go back to bed, and pretend this never happened! Then we saw Jillian who also happens to be a Triathlete. She also finished this run in 5:54. There was no backing out once we saw her. So we watched everyone run. Heat by heat. The whole time we just kept telling ourselves we should have waiting another week or two before we signed up for something like this. We are in no way runners. We are slow. We hate running, but we are working on it! We WANT to be runners… we just haven’t quite made it there. Finally it was our turn (the last heat and the slowest heat). We set two goals for ourselves. No walking. Make it through 1 mile without slowing to a walk. Finish in 12 minutes (yes we are aware that’s super slow – but again, we are super slow) – meaning we had to finish each lap in under 3 minutes. We finish the first lap in about 2 minutes – we were feeling good. The third lap we started to struggle, but at that point we were almost done! We never walked, and we kept encouraging each other along the way. (Thank goodness Deborah was with me or it probably would not have gone so well). We finished the race in 10:43. Way under our goal time and without walking! We beat our personal goals and we were thrilled. We ended up having a blast and now we want to do more! Now we have a record to hold ourselves against. Now we want to run a mile in 10 minutes and gradually decrease that time. We want to run our 5k and we will get there. Slow and steady may not win the race – but we will finish it! I recently posted about getting back on a workout regimen and eating healthy, so in lieu of this plan I recently started the Couch to 5K program with a friend of mine. We’ve been running three times a week for two weeks, and I always add in some extra runs with Paul and our dogs. Secretly I’ve always wanted to be a runner, but it’s just never been in the cards for me. So this past weekend, Paul and I went for a run while we were visiting my family in Orlando. We made it about 2 miles when I started struggling. I felt like my food from dinner was being pushed back up my throat and it wouldn’t go down. I was having trouble breathing, and I felt like I needed to throw up. At this point we decided to turn around and head back towards my parents house. On our way back, my body started having symptoms similar to an allergic reaction. My hands got tingly and started swelling – they got so big it hurt to bend my fingers. Then my ear lobes started tingling along with my forehead and my lips. My neck and armpits started itching like crazy. The whole time Paul just kept saying, “I think you’re having an allergic reaction… Let’s just get you home.” The closer we got to the house, the more frequently he asked me if he could just throw me on his back and run home. When we finally made it home I started telling my mom what happened, and she looked at me and said “oh, you do look a little puffy”. My family proceeded to feed me Benedryl and tell me to take a shower. When I went to take a shower I walked into the bathroom and looked at myself for the first time since getting home. I immediately said “Oh my goodness I look like Hitch!”. Now for anyone who has not seen this movie, Hitch has a severe allergic reaction and his face swells. I am not exaggerating when I say my entire face was swollen and I looked like Hitch!!! To add to my sweet swollen face, I had also broken out in hives all over my body. By the time I got out of the shower we started going through my day trying to figure out what could possibly cause an allergic reaction. At this point, I remembered that this has happened to me previously while working out about 5 years ago. I am ALLERGIC to EXERCISE!!! I swear! During her research she discovered EIA – Exercise-Induced Anaphylaxis, and it described what happpened to me to the “T”! Google it if you don’t believe me! Basically, something triggers this reaction during a workout. It can be triggered by eating certain foods before working out, extreme environmental conditions, etc. I have no idea what triggered it on Saturday, or 5 years ago, but it is a funny diagnosis regardless. What better excuse can you have for not going to workout than, “I’m allergic!”… (I should get a pan of brownies since I didn’t use it and I got out of bed at 5:3o this morning and went running). So there you have it – you can literally be allergic to exercise… and then after your face swells up your husband can also call you Chewbacca for the rest of the weekend. It will be fun I promise!